SoloWeb Review 2019: Is SoloWeb a Good Hosting? Mexican web hosting company SoloWeb has been offering affordable hosting solutions and associated services for several years. Its web hosting comes with quite a few features for free. SoloWeb is a Mexican web hosting and domain name registration provider that was established in 2001. 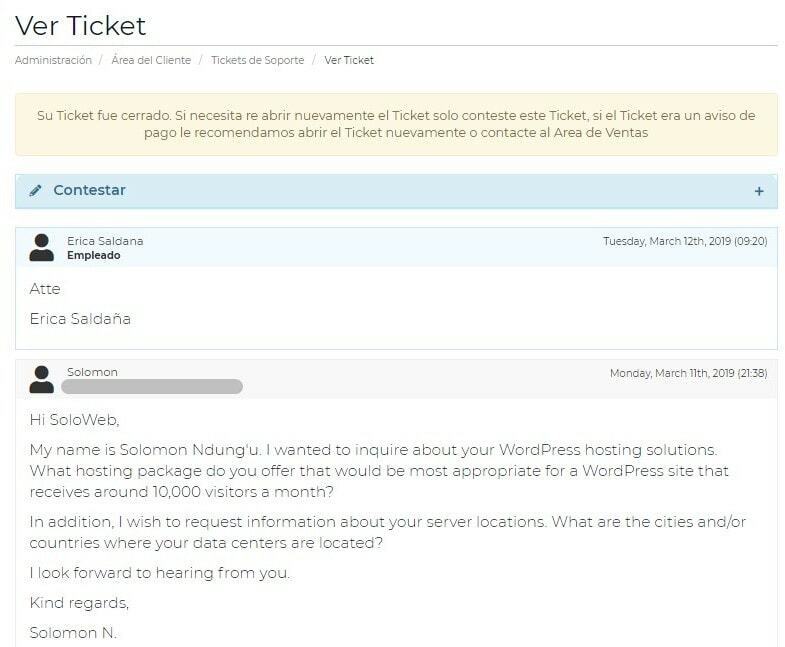 With more than 17 years of experience in the hosting industry, this vendor seems to have what it takes to host a business of any size in Mexico and beyond. SoloWeb offers shared web hosting, reseller hosting, SSL certificates, and cloud hosting solutions. Its website is available only in Spanish. The three Linux cloud hosting solutions are Basic, Professional, and Corporate. The Basic plan is ideal for websites that receive around 25,000 visits a month, and it comes with 2 CPU cores, 2 GB RAM, and one hosted website. The Corporate plan is designed for websites that receive around 500,000 visits a month, and it includes 6 CPU cores, 6 GB RAM, and the freedom to host unlimited websites. All the cloud hosting packages come with unlimited disk space and unlimited data transfer. SoloWeb has simplified backups with its CodeGuard backup package that takes daily automatic backups with built-in redundancy and one-click recovery. These backups provide protection against hackers, viruses, or even your own code that accidentally breaks your website. What’s more, you can choose your preferred backup storage space of between 1 GB and 200 GB, and the CodeGuard backup also monitors malware. This vendor’s data center facilities are located in the United States. Its cloud-based Dell PowerEdge servers provide increased stability and improved performance for high-traffic websites. SoloWeb’s hosting plans are affordable when you realize that the ‘$’ sign in the case is the sign for the Mexican peso rather than the U.S. dollar. At the time of this review, the Basic and Corporate plans were being offered at half price, making the Basic plan cheaper than the bargain basement Micro plan. At the checkout, you get a free domain and a free SSL certificate, but you are invited to pay extra for professional web design. You also get the Weebly website designer for free with hosting plans. The not so good news is that (as far as I can see), there is no free trial period, no money-back guarantee, and only 99% availability. For self-support, SoloWeb’s knowledge base is not very well populated. SoloWeb could be a good host for all types of businesses; from medium-sized business websites (with around 25,000 visits per month) to big corporation websites (with millions of website visits per month). Its cloud hosting solutions are particularly attractive for customers who require hosting solutions with ostensibly unlimited capacity. For me, this vendor’s offerings are let down by the lack of a money-back guarantee and lackluster pre-sales support. Start your search for Mexican web hosting with SoloWeb. Wondering how SoloWeb stacks up against other Web Hosting companies? Enter any other Web Hosting company and we will give you a side-by-side comparison.